In 1883 Strawberry Hill was purchased by Herman, Baron de Stern (a member of the European merchant banking family, a Portuguese baron and the 13th richest man in Britain). However, he died only three years later. 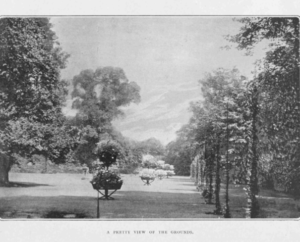 His ambitious son, Herbert, began to make use of the house to host a series of social events – an early garden party was for the recently formed Automobile Club of Great Britain in 1898. 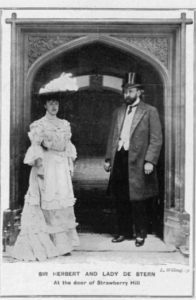 When Herbert married Aimée Geraldine Bradshaw, the garden parties became increasingly lavish. Entertainments ranged from Anna Pavlova to performing geese! Guests included prime ministers, foreign princes and lords and ladies. 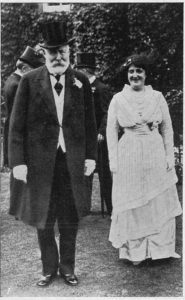 Lord Michelham hosted a notable garden party for the 1908 Olympic athletes which was attended by his relative, Jean Stern who had competed with the French fencing team and won a gold medal. In 1905, Herbert de Stern was raised to the peerage as Baron Michelham of Hellingly. The same year he registered his racing colours and the following year his horse, Plucky Liège (one of the most important brood mares of the 20th century) won both the Epsom Derby and the Grand Prix de Paris. Lord Michelham filled Strawberry Hill House with fine furniture and an impressive collection of art. Now all that remains is a stunning embroidered and tented ceiling in the Moorish style in the Blue Breakfast Room (then called the Turkish Boudoir) and a pre-Raphaelite sculpture in the Exhibition room. Lord Michelham also funded the quadriga on the top of the Marble Arch and contributed to the purchase of the Rokeby Venus for the National Gallery. On the outbreak of the First World War, Lord and Lady Michelham moved to Paris and never returned to Strawberry Hill. They contributed generously to the war effort by funding a chain of convalescent homes in France, an entire ambulance train and the use of the Hotel Astoria in Paris as a military hospital. After the death of Lord Michelham, the house was sold to the Catholic Education Service. The Lost Treasures of Strawberry Hill Exhibition, which runs from 20 October 2018 – 24 February 2019, is sponsored by J. Stern & Co., whose Managing Partner, Jérôme Stern is a descendant of the French branch of the Stern banking dynasty. J. Stern & Co. is a private investment office, managing assets for families, trustees and charities for the long-term, building on the Stern family’s 200-year banking heritage. It is thanks to their generosity that masterpieces from Walpole’s collection will return once more to his extraordinary gothic villa. 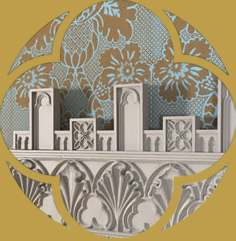 To find out more about the Lost Treasures of Strawberry Hill Exhibition and to book tickets, visit our Exhibition page HERE.